A cultivar of Dendranthema x grandiflorum Kitam. 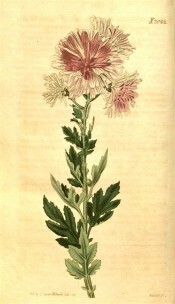 Tassel flowered chrysanthemum. Listed in the catalogues as ‘Old white from China’. ‘The first white flowered variety known in our gardens. It is recorded in the Horticultural Transactions to have been raised from a sporting branch of [the Tasselled Purple], and, indeed resembles it in everything but colour. It is a very graceful and elegant plant, and in warm situations its flowers are often more or less tinged and dotted with purple or blush colour.’ The ‘Tasselled Purple’ is described as ‘a very beautiful and rather early-flowering plant, of almost the middle size. The flowers are very numerous, and gracefully drooping, and of middle size.’ [FC p.73/1833]. ‘Most of the [varieties] seem to be permanent; but some of them, we are told, are liable to change their colour from change of soil and situation; and the one here figured has certainly this tendency, and owes the rich colour of the inner petals to its having been planted in a warm situation, where it was exposed to a very burning sun; and may therefore be expected, under different circumstances, to return again to its original white.’ [BM t.2042/1819]. For general information on the botanical and horticultural history of the Florists’ chrysanthemum see Dendranthema x grandiflorum Kitam. Listed in the 1845, 1850 and 1857 catalogues [H.64/1845].